Our products are carefully chosen from manufacturers who share our commitment to performance and long-term support. We always pay attention to new technologies and seek out new companies that offer genuine advancements, but never use our clients as ‘beta testers’. You can be assured that any component represented by AudioConcepts is coming from a solid manufacturer with a proven track record. When you combine our product selection, demonstration facilities and years of experience, you can be assured of choosing the perfect system for your home. For a list of recommended equipment on a budget, CLICK HERE. Despite the launch of the compact disc three decades ago, people continue to enjoy analog records. The alluring, and some say unmatched, sound quality and the huge catalog of affordable titles are only two reasons. 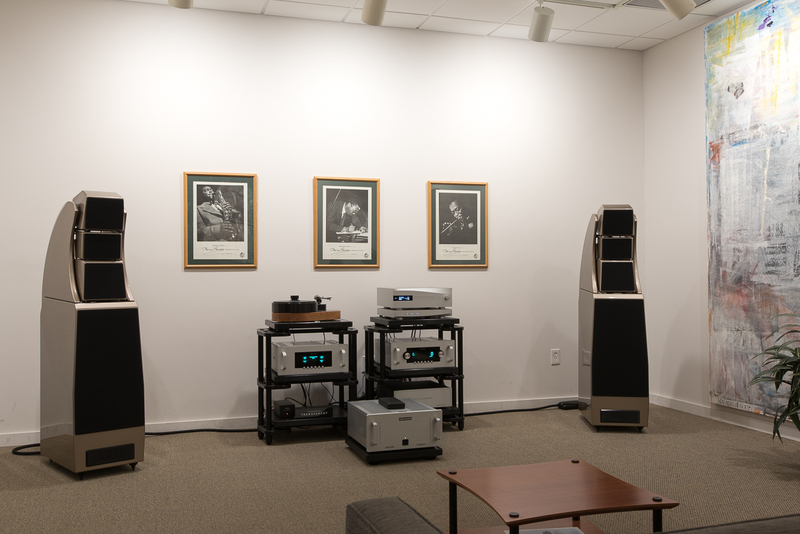 AudioConcepts has over thirty years of experience supporting state of the art analog playback for customers in Dallas and beyond; we’ve sold and serviced thousands of Linn, Rega, Goldmund, and other turntables and are expert in the art of table setup. We carry many turntables including Rega models- the industry’s affordable reference for many years that start at only $479 for table, arm, and cartridge. For top notch LP playback, we strongly recommend the Linn Sondek LP12, the table you’ll find playing in our homes. Linn has spent over thirty years advancing the state of the art in record playback. 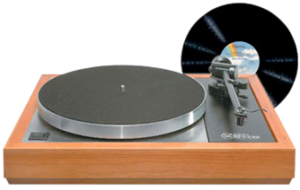 And the AMG turntables from Germany are also worth your consideration, with their very solid design and engineering. You can listen to several turntables in a range of price points, and make your own decision. Whatever table you select, we’ll help you pick the right phono cartridge and phono stage, and fine-tune the overall table / arm / cartridge alignment, to make sure you’re getting the ultimate performance from your vinyl records. Have an older Linn? We can bring it back to life with a tune-up or complete rebuild and any of several component upgrades that Linn offer, and make your LP12 perform like new. Visit our LP12 tuneups and upgrades page here. Source components play a large part in determining how your system sounds; the old adage ‘garbage in, garbage out’ definitely applies, whether you’re considering a compact disc player or DVD / BluRay player. Most DVD players typically fall far behind even modest CD players when it comes to playing music, so if music performance is important to you, you may want to consider a dedicated CD player. You’ll get the very best digital playback today by setting up a music library on a computer or NAS drive, and playing it back via a Linn DS or dCS network music player; this setup also offers the added convenience of storing all of your music in one place, with quick and easy access via touchscreen or computer, and giving you the opportunity to enjoy streaming solutions like Tidal. We can show you many ways to enjoy a computer music library and music streaming with your existing audio or theater system, and throughout your home. Have an older compact disc player? You might be surprised at the improvements that are possible. The relatively affordable Rega Apollo-R ($1095) easily betters many multi-thousand dollar machines from the past. And many of our top of the line CD players also include digital inputs, so you can spin discs and get excellent sound from a laptop or networked digital device with just a single product. Music lovers will feel very comfortable at AudioConcepts. Our passion for over thirty years has been to get you as close as possible to the sound of a live musical performance. No matter what your budget, we take great pleasure in showing you just how good your favorite digital and analog music can sound with the right components. NAD has been the entry into high-end performance for many people for over thirty years, and their solid engineering continues today. Stepping up the ladder can get you even more listening pleasure- Rega, Naim and Linn offer great choices for an excellent music system. For the ultimate performance audition vacuum tube products from Audio Research and solid state models from Boulder and D’Agostino, and enjoy a truly ‘high definition’ audio experience. Despite the popularity of home theater systems, many people today are returning to music, often setting up a dedicated system in the main living area of the home to enjoy with friends and family. We can help you keep the music playing in your life- stop by for an audition. Home theater systems that are equally compelling for both music and film can be tough to assemble. The ‘home theater in a box’ or mass market / online system purchase may very well reproduce explosions and sound effects in your living room, but will leave a lot to be desired when you want to listen to the latest Beck album or your favorite classic rock or jazz recordings. Our solutions can do it all. We start with NAD receivers, which offer sound quality that is clearly a step above competing products in the same price range. Many of NAD’s models also include their MDC Modular Design Construction so you can upgrade as technology changes- an important consideration with today’s evolving technologies. For the best possible AV electronics solution, you simply can’t beat the performance, build quality, and ease of use of the McIntosh AV preamp/processors and multichannel power amps. Our favorite display devices come from Sony, and we have their 4K projectors and flat panels on demonstration. We’re happy to make a recommendation for you based on your room, lighting, and other considerations. On display in one of our demonstration rooms is a complete Dolby Atmos system, so you can check out the newest and most immersive way yet to enjoy movies at home. Our Atmos system features the latest NAD T777 v3 receiver, a Kaleidescape movie server, Sony OLED 4K display, and a full complement of GoldenEar speakers. Stop by for a demonstration, and learn how you can easily integrate a similar system into your home. Speakers can be the most difficult choice, especially if you have limitations on things like size, placement, finish, etc. They can also be the most subjective; unless you’re getting a pair of Wilson Audio Alexandria XLFs, compromises inevitably have to be made regarding different performance attributes and of course budget. We carry a wide range of speakers and, with a little discussion about your room, performance goals, and other equipment, can help you narrow it down to a few good models to audition. Linn and GoldenEar have several in-wall and in-ceiling models that can be inconspicuous and bring great sound to other areas of your home. It’s always better to use a conventional speaker whenever possible though, because the trade-offs are significant even with the best in-walls. This is especially true for primary front and center speakers in a home theater system- you’re making a huge compromise if you go to an in-ceiling speaker here. When selecting speakers, you’ll do best to make your comparisons with a range of your favorite music- even if it’s for an AV application. A good speaker doesn’t suit music more than movies or vice versa, and music can more easily help you distinguish differences. All of the manufacturers represented here have matching center channel models, so you can set up a great music system or a complete home theater system. Headphones are a great way to enjoy your music- either on the go, or when you don’t want to disturb others around you. And a top notch pair of headphones and good headphone amp can often get you much closer to your music than a similarly priced pair of speakers. We have models from $79 and up, including models optimized for portable playback devices and iPhones, some for airline travel, and others for serious home sit-down listening. 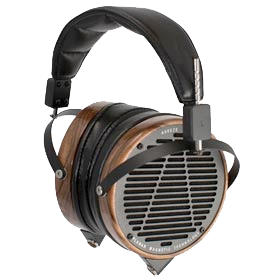 Typically available for audition are headphones from Audeze, Focal, Grado, and Sennheiser. Our headphone amplifier / DAC models on display include the portable Chord Mojo and others from McIntosh and Moon by Simaudio. You can listen to selections from the large music library on our iMac, or feel free to bring in and connect your portable device if you like. Try a few models on and see not only what sounds best but also what’s most comfortable. Accessories for your audio system, including cables, power distribution, and even support devices and stands, can make a profound improvement to the overall performance. In fact without them, you’ll never actually enjoy the potential your system has to offer. They’re so important that we’d rather not even label them as accessories, but as key components. Quality signal cables (speaker cables and interconnects) play a key role in maintaining the integrity of the musical information as it passes through your system. For best results, you should try and use the same manufacturer’s signal cables consistently throughout your system. We’re always happy to compare different solutions, so you can confirm for yourself the potential advantages, and we can also make a cable recommendation for your system- just ask. The right power distribution products and power cables can not only keep your system safer from the noisy and variable electric supply in your home but they can also isolate noise being transmitted from component to component, and improve sound (and picture) quality. As with signal cables, we are happy to demonstrate and make recommendations for your system. For those looking for furniture to simply house their components and perhaps support a large flatscreen TV, Salamander’s flexible and attractive cabinet solutions can’t be beat. They’re available in an enormous range of sizes and finishes, with many options, and are manufactured here in the US to a very high standard especially considering the reasonable price. For a solution that can actually enhance the peformance of your system, the Quadraspire component stands are a great choice- they’re very minimal in design, come in a range of finish options, can be reconfigured if your system changes, and are reasonably priced. They also look great, and are very popular with our clients. And for the very best support system for high performance components, where you want to really address resonance control and maximize the sonic potential, check out the HRS isolation bases and stands. You may be as surprised as we were when you hear the perfomance improvements they can bring to a highly resolving system.